I originally wanted to read this book because I am completely in love with Downton Abbey. The movie centers around three very different women who lie in the same building in downtown Atlanta. They find themselves attending a weekly screening of the first two seasons of the wildly popular BBC series Downton Abbey, arranged by the concierge of the building, Edward. Claire, Brooke, and Samantha slowly become friends, each week bringing them closer together. I really enjoyed this book. While it can be labels chick lit to some degree, it is clearly written in a more mature voice than many out there. 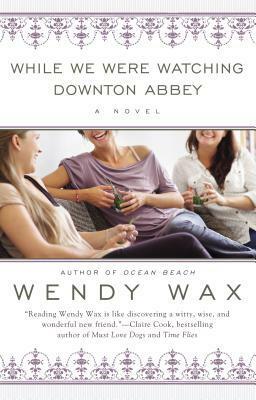 Wendy wax is a wonderful writer who really brings her character-good and bad-to life. I would love to see a sequel- especially more about Edward! You won’t believe this but I’ve never seen Downton Abbey, so I’ve been hesitant to pick up this book. I just read today that it’s possible to enjoy it without having seen the series so I’ll have to look for it. You can definitely read it without having seen it- the book stands on it’s own. But- I would really recommend the show-it is wonderful! I’ve been curious about this book for a while now. (I LOVE Downton Abbey, like the rest of the world, lol) Yours is the 2nd review I’ve read today for this particular book and you’ve tipped me over the edge. I’m going to request this from my local library, thanks!! I haven’t watched Downton Abbey either, but I thought I’d enjoy getting a taste of it by listening to this audiobook. I’m not very far into it yet, but I like it so far. You make it sound really good! This book sounds great – similar to The Jane Austen Book Club. I’ll check it out!! I enjoyed this one too! The title of course is what got me to read this book because I’m a Downton Abbey fan. Thanks for the review. I saw this book in the bookstore and it looked good, but I was unsure. Sometimes I find that the books that are centered or started around a really popular thing, can be disappointing. I will have to check it out. Downton Abbey is really good. I did pick it up because I LOVE DA, but it actually doesn’t center around it- just some cool references. I think a person who never watched DA would still enjoy it- a fun easy read.